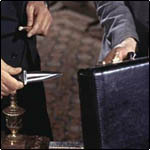 Description: Bond's first gadget was actually a black briefcase sporting a knife, 50 gold sovereigns, 20 rounds of ammunition, a .25 caliber AR-7 folding rifle, and an exploding container of tear gas. 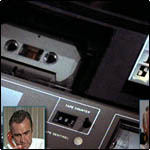 Description: Years ahead of its time, Bond had a beeper in 1963. It was used to summon Bond to another ahead-of-its-time gadget: a car phone. The beep was HQ telling Bond to return; but there was still a little time to reacquaint himself with Sylvia Trench. 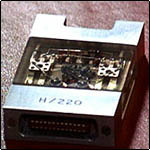 Description: This Russian decoder device that is what Bond is sent to Istanbul to retrieve. 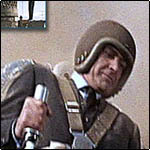 Description: Bond uses this jet pack to escape from the mansion in the opening sequence of Thunderball. He strapped it on, flew over the wall, and tossed it in the trunk saying "No well dressed man should be without one." 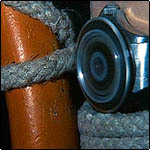 Description: In the event of a rebreather not being available, this gadget was to be used for short times only: say five minutes. 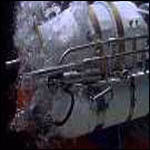 Bond used it twice: once to escape from the shark tank, then again to finish the final underwater battle. 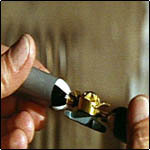 Description: To find out when the bombs were aboard the Disco Volante, Bond gave Domino this Geiger counter camera. 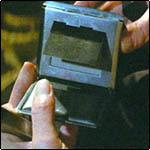 She never had the chance to tell Bond of its findings though: Largo smashed it to bits and tied her up as punishment. Description: It contained everything but the kitchen sink. "On you, everything looks good." (Felix Leiter). This underwater pack had spear guns, a propulsion unit, a light, and more. Of course, Bond left it on the bottom of the water. Description: Contained in four alligator suitcases, this "little girl" has everything to stop SPECTRE helicopters. It had two machine guns, two forward firing rocket launchers, heat-seeking air-to-air missiles, two flame guns, two smoke ejectors, and aerial mines. Description: When Bond broke into Draco's lawyer's office to find out the whereabouts of Blofeld, he used a portable copy machine to duplicate the documents. 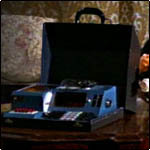 Description: Both Bond and Blofeld use this machine to change their voice on the phone. 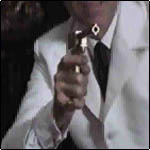 Bond pretends to be Burt Saxby and Blofeld imitates Willard Whyte. 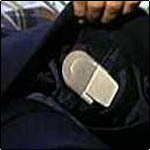 Description: A must for the secret agent on assignment. 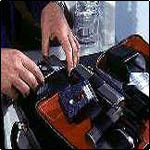 This suitcase contains a signal sender that was picked up by Quarrel Jr., a bug detector, and even a shaving kit. Description: This was no ordinary Rolex. 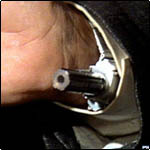 It turned into a spinning blade that cut through rope, a magnet, and created a shield around 007 that could deflect the path of a bullet. Description: This bullet brought Kananga to his end by inflation. 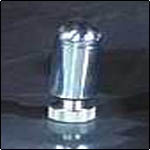 Contained in this little bullet is enough compressed air to blow up a couch, or a man. Description: Quite simply, Scaramanga's golden gun for which he is well known. It is collapsible so it can go undetected by security. 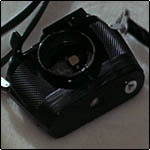 Description: The Solex was at the core of Scaramanga's plan. He used it to focus the light to create a laser. 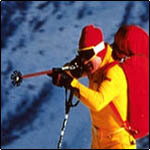 Description: While escaping from his attackers, Bond turns around and fires his ski pole which doubles as a flare gun. 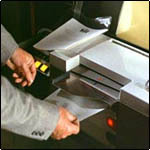 Description: After retrieving the microfilm from Egypt, Bond uses this little device to view it without Agent Triple-X knowning. 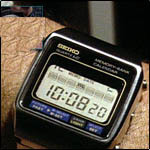 Description: This time, Bond's super-watch was a Seiko. 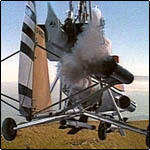 Inside, it contained a string of plastic explosives powerful enough to blow up the grating in the rocket pit. Description: To be worn at all times by all Double-0's in the field, this dart gun responds to the movement of the wrist. It shoots two kinds of darts. It was used twice: first to escape the G-Force emulator machine, and to kill Drax. 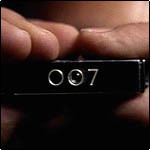 Description: This pocket sized camera sports the 007 logo and is able to take pictures in dimly lit rooms where Bond is not supposed to be. In this case, to take photos of the Moonraker blueprints from Venini Glass. Description: Perhaps the most unbelievable Bond gadget of all time. 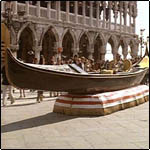 A gondola that turned into a hydrofoil even made a pigeon do a double-take. Still, a great way to escape his water-bound assailants. 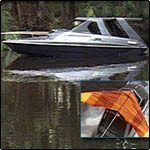 Description: This boat is equipped with rockets, jet propulsion, and a hand-glider that can be used in an escape. Bond uses this boat while he is escaping from Jaws.